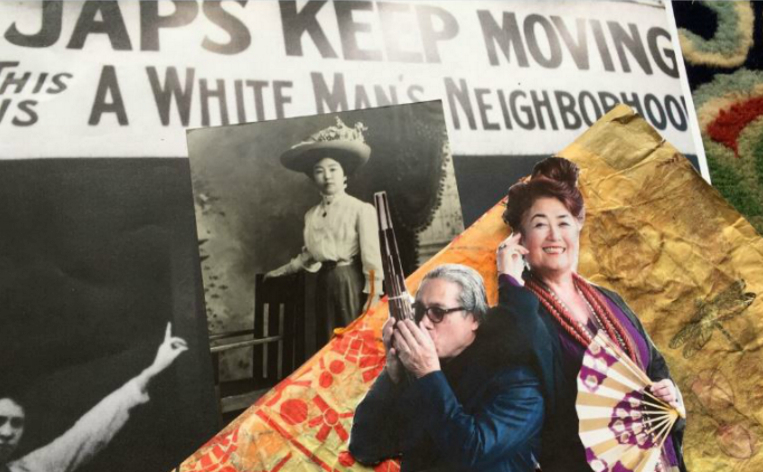 SAN FRANCISCO — “Aunt Lily’s Flowerbook: One Hundred Years of Legalized Racism” will be presented by Brenda Wong Aoki and Mark Izu from May 27 to June 3 at Southside Theater, Fort Mason Center. A hippie storyteller and jazz musician from the 1970s tell true tales of resilience: A grandfather who built the railroad, a father in the 442nd Regimental Combat Team while his wife is in the Poston concentration camp and with aunts and uncles in Hiroshima, and the genesis of the Asian American Movement. “Aunt Lily’s Flowerbook” is a compilation of storyteller Aoki and musician Izu’s greatest hits over the past 40 years plus new stories and memoirs woven together with live music, vintage San Francisco photos and film from the Victorian period, World War II, and the Movement. Written and performed by Aoki with music by Emmy Award-winning composer Izu and featuring koto master Shoko Hikage. Showtimes: Saturday, May 27, at 9:30 p.m.; Sunday, May 28, at 2 p.m.; Saturday, June 3, at 7 p.m. Tickets are $25. For reservations, go to https://fortmason.org/event/aunt-lilys-flower/. Southside Theater is located in Fort Mason’s Landmark Building D. Enter Fort Mason at Marina and Buchanan streets. Hosted by Fort Mason Center for Arts & Culture (FMCAC) as part of the San Francisco International Arts Festival, which runs from May 25 to June 4. The festival features more than 100 performances by over 60 different artists, ensembles and companies. Get discounts on tickets to see multiple shows by buying a festival pass. For more information, visit www.sfiaf.org. Brenda Wong Aoki is a storyteller, anthologized playwright, producer and artistic director. Known for her agility across disciplines, she creates monodramas for symphony, dance, solo performance, taiko and jazz ensembles. As the first nationally recognized Asian American storyteller, trained in traditional Japanese noh theater, Aoki’s stories are inspired by traditional legends and everyday life. Her work has been produced worldwide. A curriculum developer and educator, Aoki is a founding faculty member of the Institute for Diversity in the Arts at Stanford University and has been an artist-in-residence at various institutions in the U.S. and Japan. She’s been a governor for The Recording Academy, worked with the Grammy Foundation, and currently is a board member of California Humanities. Aoki has deep roots in San Francisco. Her grandfather was a founder of Japantown in the 1890s, and her grandmother was a leader of the first Chinatown garment union. She lives in San Francisco with her husband and artistic collaborator Mark Izu and son, Kai Kāne Aoki Izu. This year, she celebrates the 120th anniversary of the Aoki family in San Francisco. Composer, producer and bandleader Izu has fused the traditional music of Asia with African American improvisation. He plays acoustic bass as well as several traditional Asian instruments such as the sheng (Chinese multi-reed instrument) and sho (Japanese multi-reed instrument). Izu has composed scores for film, live music concerts and theater. In 2009, he won an Emmy Award for outstanding music for his score in “Bolinao 52.” His film scores include Steven Okazaki’s Academy Award-winning “Days of Waiting”; the Emmy-winning documentary “Return to the Valley”; and a new score for the DVD release of Sessue Hayakawa’s 1909 masterpiece “The Dragon Painter” (Milestones DVD, 2007). His theater scores have been performed at the Kennedy Center, Lincoln Center, and Sundance Festival and he was awarded a Drama-logue Award for best original music and two Indie Awards for best CD. Izu’s other awards include Meet the Composer, Gerbode Composer Commission, Asian Business League Artist Award, Rockefeller MAP, National Endowment for the Arts, and San Francisco Arts Commission. He was a founding faculty member of Stanford’s Institute of Diversity for the Arts in 2002. In 2007, he received the U.S./Japan Creative Arts Fellowship to Japan sponsored by the National Endowment for the Arts and the Bunkacho. For more information, visit www.firstvoice.org.